Accounting: Logan Schlegel-tied for 2nd place. Current Issues and Events: Logan Schlegel-1st place; Maddie Reynolds-2nd place; Colten Ellis-6th place. Copy Editing: Adrian Mahan-1st place; Kaylee Twilligear-4th place. Feature Writing: Jadan Parrish-6th Place. News Writing: Zoe Gerk-2nd Place. Literary Criticism: Zoe Gerk-1st Place; Kaylee Twilligear-3rd Place; Hailey Cating-4th Place. Social Studies: Cooper Taylor-5th Place. Spelling and Vocabulary: Leah Bullinger-1st Place; Chase Borchardt-3rd Place. Informative Speaking: Emily Beaman-1st place; Ian Robinson-2nd Place. Lincoln-Douglas Debate: Ian Robinson-5th Place. Persuasive Speaking: Andres Revis-1st Place; Jenna Toulan-4th Place. Poetry Interpretation: Davis Scobee-1st Place; Daisy Canada-2nd Place. Prose Interpretation: Kori Riley-2nd Place. 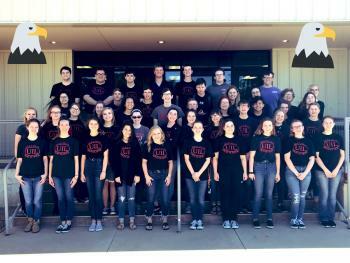 The combined success of all of the competitors earned the Academic Team the Regional Academic Championship by over 140 points BEFORE the One- Act Play competes on Monday.